The egg Scrubber arrived looking exactly like the photos. 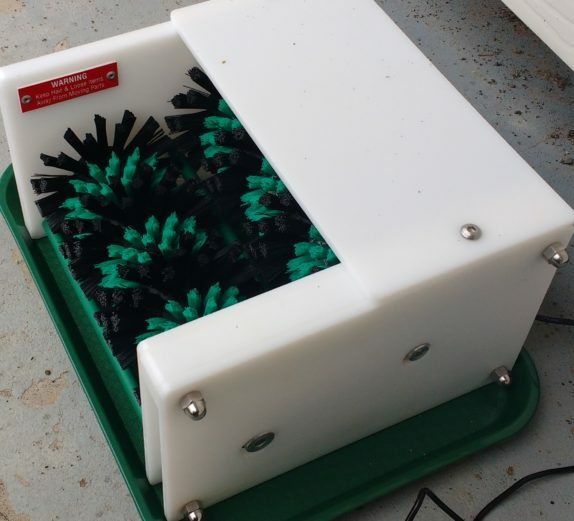 Included is an egg soak enzyme, a scouring pad, and a green tray that acts as a reservoir for water to help in cleaning. After a week of use, we found the enzymes and the pad to be unnecessary in cleaning the eggs to acceptable condition. While the eggs soaked in the left-hand sink, we placed The Little Egg Scrubber into the right-hand sink and plugged it in. 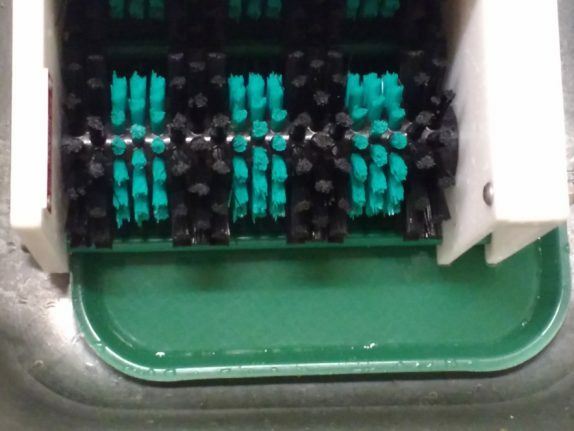 The motor waits a second, then starts right up, turning two roller brushes against each other. 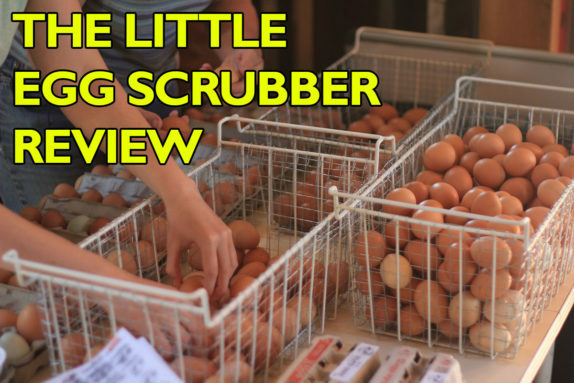 Here is a demo video of us using the egg Scrubber to clean our first test batch of 25 eggs. 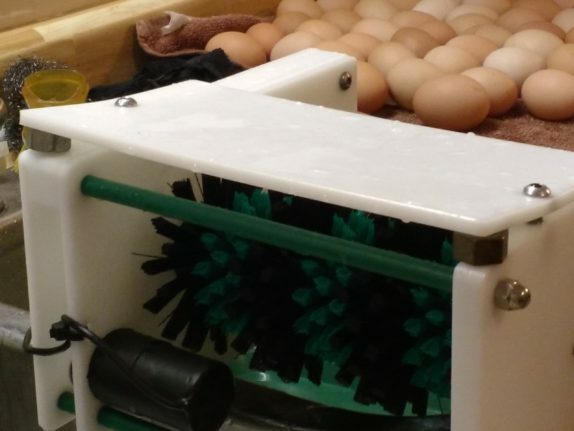 Our egg cleaner placed three eggs into the brush pockets and turned on the machine by plugging it into the wall. Water ran over the top of the unit and dropped onto the eggs below. A lot of water also dropped uselessly off the back, which we fixed by propping the unit at an angle. The sink emptied surprisingly fast. Our initial opinion: Cautiously Impressed. We made a few modifications to speed up the process. 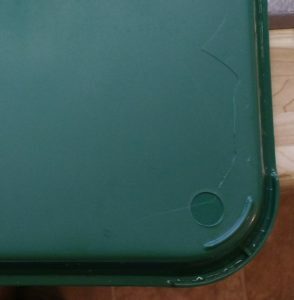 We loosened the top plate and wedged a couple of bolts toward the back and tightened it down, thereby making the top slanted toward the front. All the water from the faucet now dropped onto the eggs. A similar modification is now standard on all new The Little Egg Scrubber units. We also moved the left foot of the unit off the tray, which allowed us to face the unit forward instead of to the side. 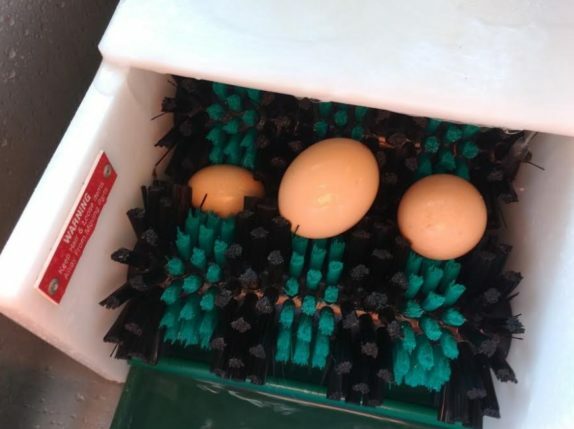 The second trial washed 107 eggs in 7 minutes, 56 seconds, or 4.45 seconds per egg, not counting soaking or cartoning. Half the time!! It was at this point we knew the Little Egg Scrubber delivers on its promise. Clean eggs in LESS than half the time their website proclaims, and it’s true! We washed sizes from pullet to extra large without a problem. One very miniature egg lodged itself into the brushes and had to be retrieved with the motor off, so clearly quail eggs will not work in this machine. 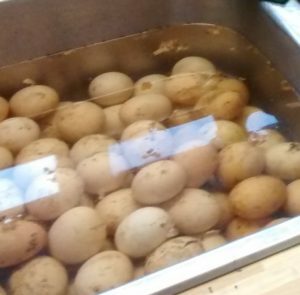 Although we never washed an obviously cracked egg, one particularly thin shelled egg broke while being extracted, and the Scrubber threw the shell up over the back and out of the way. We just stopped the machine, rinsed the tray, and went on. Afterwards, we found a pecked egg on the drying rack, but it had gone through the rollers without further damage. The Little Egg Scrubber clearly doesn’t beat the eggshell to death. Normally we catch cracks as we wash, but with the machine we are more focused on keeping the eggs moving through. In the future, close inspection as eggs are cartoned will be important. Taking the eggs off can be a bit tricky, as they are slippery and tumbling on the brushes. We haven’t dropped any yet, but occasionally fingers get jammed in the rollers and the motor stops. It appears that this is a fail-safe so that the eggs don’t get pulled through the bristles and broken. The beauty of the Scrubber is that it cleans three eggs at once, whereas a person can clean only one at a time. It also keeps the operator moving quickly to replace each egg, and so it pulls you along to keep up with the machine, although not in a stressful way. It’s easy to operate, not overly noisy, effective, and efficient. 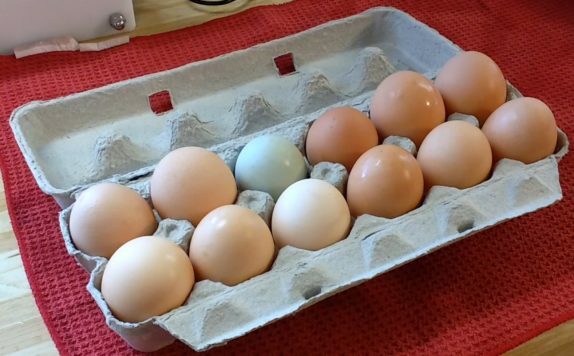 We were pleasantly surprised at how well it cleaned even very dirty eggs. 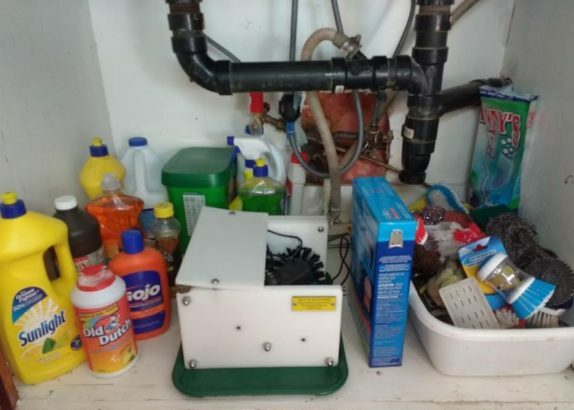 And it’s a very tidy compact little unit, which fits easily under our sink. The inventor took some of our suggestions for improvement and has adjusted the design slightly. The top is now curved to move the water forward. He’s adding a stop/start switch. Our sink is a standard size, so he’s looking into a different tray that will hug the Scrubber dimensions a bit closer, although we are finding that with the modification to the top, we may not need the tray at all. So, in conclusion, we are very happy we got to test The Little Egg Scrubber. It’s winter now, so the hens are only laying 20 per day, but we can hardly wait to use the unit when they are again at their peak. 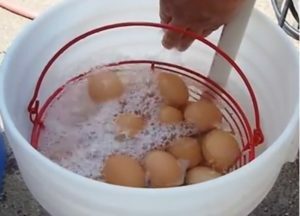 Soaking the eggs will be faster too, because we can load more into the sink at a time without loss of a safe water temperature. In the past, we looked at egg washers that cost $1000 and up. For the time saving as a small farm, we were seriously considering the expense, and willing to spread that cost over time. But at $269 US, this Little Egg Scrubber is the best of all worlds, a three point win: Fast. Cheap. And Good.